Does your old carpeting need a makeover? Getting a free carpet installation estimate with The Carpet Guys is your best bet for new carpeting. We carry high end products from the top leading manufacturers, and we are ready to renovate your floors. 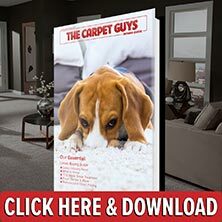 With The Carpet Guys at your side, getting a new carpet installation is easier than ever. No more pressuring salesmen or rushed purchases. We accommodate with your schedule and give you as much time as you need to make a decision. Don’t just settle with any random carpet dealer to get the job done quickly. Schedule your estimate with us and get a quality job done in your home. Plush Carpet – For a home that gives off a more sophisticated and classy look, Plush will make a great addition. It also works well for people who simply like to lounge around on the floor. Frieze Carpet – Any room that shows off a causal and informal look needs to have Frieze in it. Frieze offers an off-the-cuff look with a hint of personality like no other. Berber Carpet – All homes that experience a large amount of foot traffic need some Berber installed in them. This durable carpeting lasts long and hides dirt exceptionally well. Looped Carpet – Looking to add some extra interest underfoot? Our multi-leveled Looped carpeting will do the trick. Find it in many different colors and patterns that are sure to please. Book your free in-home estimate with us and get the carpet that you want installed today. We guarantee that will be completely satisfied with the work and products we provide. New carpeting is only one step away.